The S481 PD ES is packed with some great features; this model has the addition of an electric key start 160cc Mountfield ST55ES OHV engine. There's no need to pull on a rope cord to start this mower, simply turn a key. 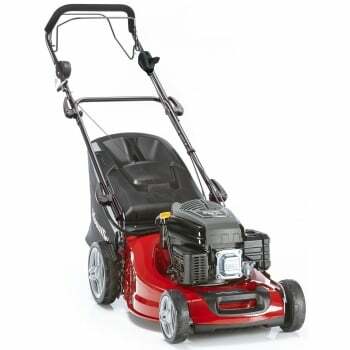 The engine on this self propelled lawnmower, provides drive to the rear roller, as well as the cutting blade, so you don't have to push the mower, making it easy to use, especially on sloping ground. 6 pre-set cutting positions ranging from 26mm to 72mm are easy to adjust, using the single lever height adjuster. . The large grass collector holds 70 litres of cuttings and lifts off the back of the mower easily for emptying, an indicator shows when the collector is full. The mower can be used without the collector, if you wish to leave the cuttings. Also supplied with a mulching plug, you can recycle the cuttings and save time, money and effort. The 48cm cutting width makes the S461 PD ES ideal for medium - large sized lawns up 50m x 50m.